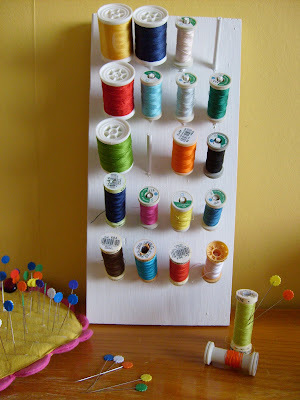 Miss Pelicano: Cotton Reel Rack - Tutorial! 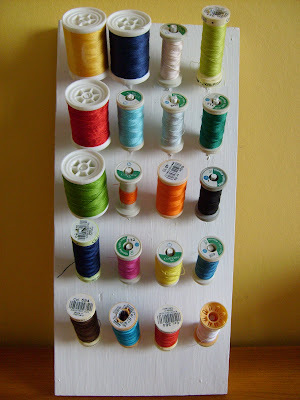 I've always wanted to have a cotton reel rack. It really was quite easy, after she explained how to hold the drill at a 45 degree angle, approx. Now I feel I could make another one all by myself. All this you can probably get at your local warehouse. Here we've got Bauhaus, for example. There you can find everything you need for this project and you can even borrow the saw on the spot to get the wooden board the right size and rent a drill. Measure up with a ruler and mark with a pencil where you will be drilling the wholes. Make sure they are evenly spread out and that the distance is big enough to fit the reels beside each other. Mine are 3 cm apart, horizontally and 5 cm apart, vertically. I can fit both small and big reels. Place the wooden board on a flat surface (with a pice of waste wood underneath to protect the surface), or use a workbench. Place the drill (make sure it's the same measurement as the stick - your warehouse will help you with this, or you can even do it yourself) on the pencil marks and hold it at a 45 degree angle approx. so you get the sticks slanted. Drill firmly but carefully approx. 1 cm into the wood. You can measure 1 cm from the drill end and put a bit of tape there just so you know when to stop (when the tape touches the wood). Dip an end of the sticks in the wood glue and push them in through the wholes. Wipe off excess glue. Let dry. How long, really depens on the glue. Mine needed approx. 30 minutes to be ready for painting. The measurements of my cotton reel rack are: 30 cm x 14 cm x 1,5cm. At least 1,5 cm in width is advisable so you can really make sure the little sticks are properly fixed, although you need some wood glue anyway, before you put them in the wholes, just to make it more secure. Be careful not to drill right through the wood. If you happen to do that it's really not a big problem. It just means that you have to make sure the stick doen't pop out the back when you glue it in. I drilled once right through, but as it's on the back you don't notice it. It's really quite easy! If you want to attempt to make one and you find this tutorial a bit confusing, don't hesitate to ask me! Bem, está engraçado, mas quando tens centenas de rolos de linha, como vais fazer? Eu prefiro a minha caixa de costura à moda antiga! Mas acho que está muito giro. E onde o penduras? Penduro na parede ao lado da máquina de costura. e quando tiver centenas de rolos abro uma fábrica! ;) E ainda tenho a antiga caixa de costura! Que óptima solução, gosto muito! Do branco, das cores das linhas, dos alfinetes! Uau, Bárbara, ficou fantástico!! Acho que toda a gente que cose quer ter um suporte desses!